Updated April 2019 to include a printable version. 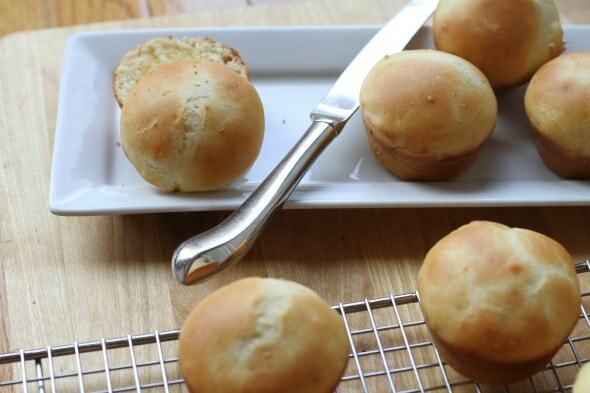 When I posted the no-knead English Muffin batter bread recipe, I was poking thru my archives to find my recipe for no-knead batter rolls, and much to my surprise, I realized I never posted it. I suppose it’s possible that it’s just hiding super well, skulking around in the shadows of the archives, but I kind of doubt it. Anyway, I thought this should be rectified, so I mixed up a batch on two separate days for photographing purposes, and my kids were highly gratified. Like the English Muffin bread batter, this soft dough/batter just needs to be mixed well (a stand mixer is super helpful), and then left to rise…no kneading necessary! And the resulting rolls are soft and delicious. 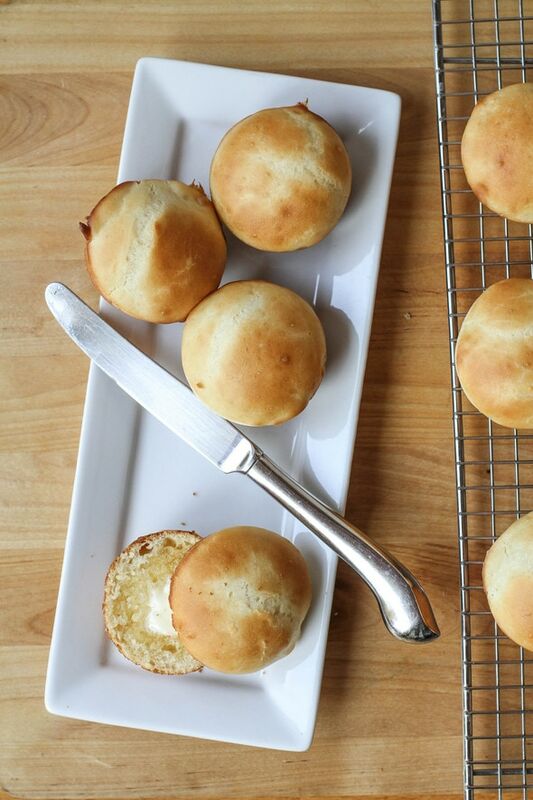 You can’t make them into fancy shapes like you can with regular roll dough, but if you’re content with a muffin-tin-shaped roll and want something quick and easy, these are the ticket. First, you combine the yeast and flour in your mixer bowl. 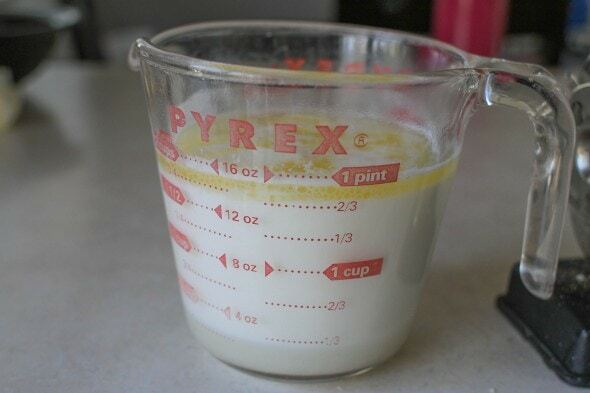 Next, heat the milk, butter, sugar, and salt to 120° F. I just do this right in the measuring cup for pouring ease and to save a dish. Pour the liquids into the flour mixture and mix on low speed. Add an egg, and beat for about 3 minutes. The dough is definitely more like batter at this point. Then stir in the remaining flour and beat the dough on low speed for two minutes. The dough will still be more on the batter-ish side of things, which is as it should be. Scrape the dough from the beater, cover the bowl with a wet tea towel, and let it rise for an hour. 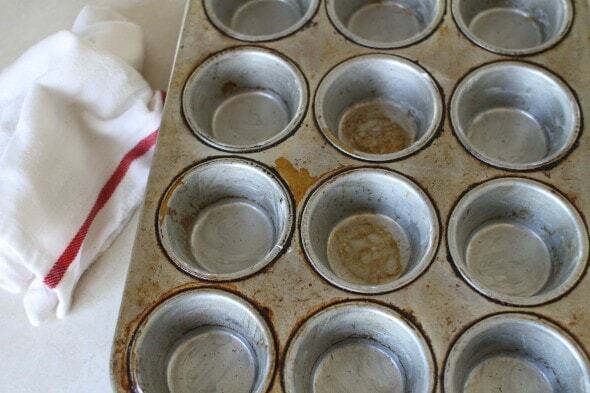 Prepare your muffin tins by greasing the cups with butter. Alternatively, you can use cooking spray or whatever is your grease of choice. 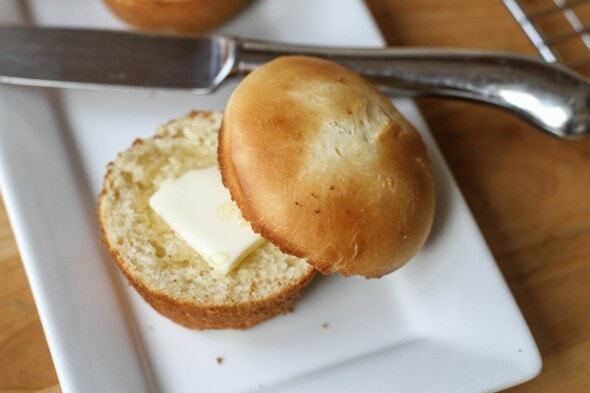 The recipe makes about 1.5 dozen rolls, so you’ll want to grease a pan and a half. Your risen dough will still be pretty goopy, but will be a little more stretchy after its rise. Use a metal spoon to stir the dough down a bit, and then scoop the dough into the greased cups. 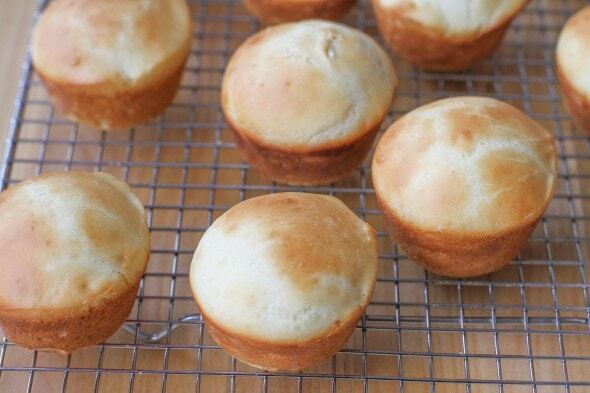 Your muffin cups will probably be a little sloppy looking, which is ok.
Cover the tins with a wet tea towel and leave them to rise for about 30 minutes, at which point the cups should look pretty full. You want the oven to be already hot by the time the rolls are done rising, so start the preheating process when the rolls are about 10 minutes from the end of their rising time. 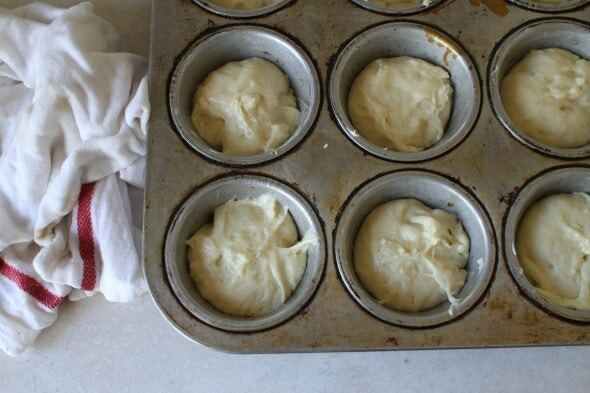 Your rolls should be done baking in about 12-15 minutes, but since pans and ovens vary, just keep an eye on them. Once the rolls are done, remove them from the pan (this should be easy if you greased well) and place them on a wire rack. These are at their most fabulous if you eat them right away, hot from the oven. But no one here has ever complained about eating the few that are leftover. Afraid of kneading? This recipe is for you! 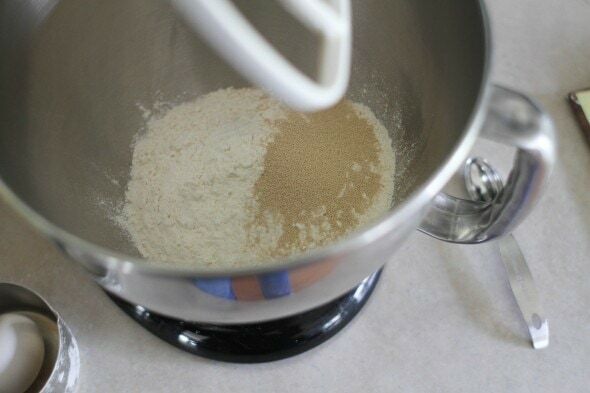 In a large mixer bowl, combine 2 cups of the flour and the yeast. 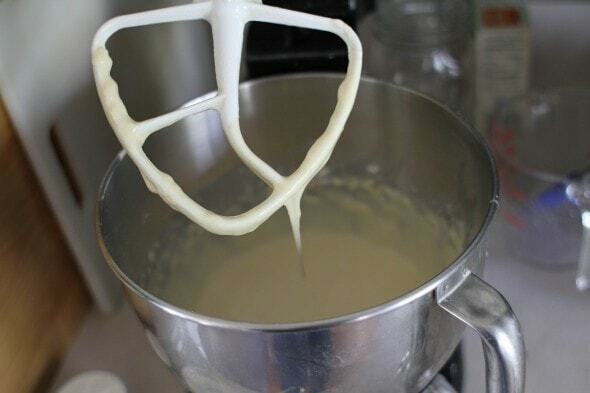 Combine milk, butter, sugar, and salt, and heat to 120° F.
Add liquids to dry ingredients in mixer bowl; beat to combine. Add egg and beat 3 minutes at high speed. 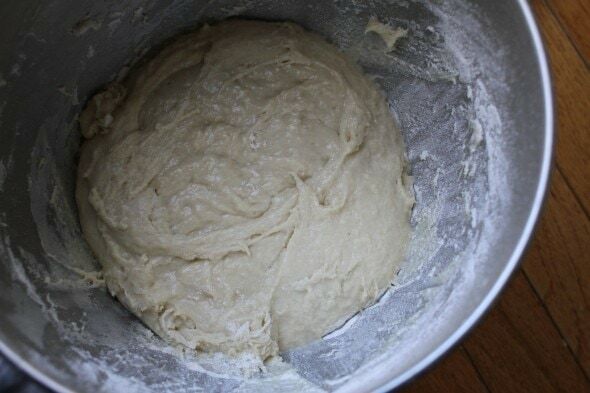 At low speed, beat in the remaining flour to make a soft dough; beat on low for two minutes. Use a rubber spatula to scrape dough off beaters, then cover bowl with a wet tea towel and let dough rise for 1 hour. 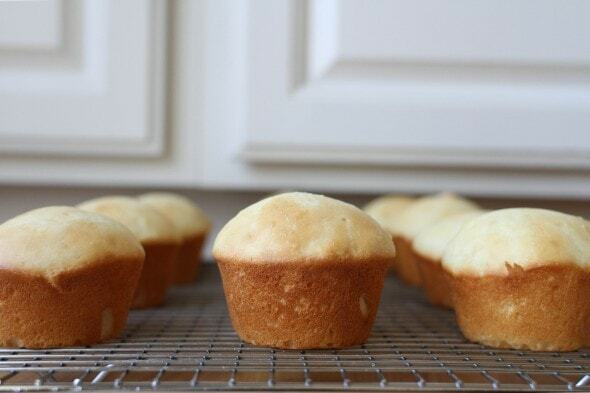 Grease 18 muffin cups with butter. 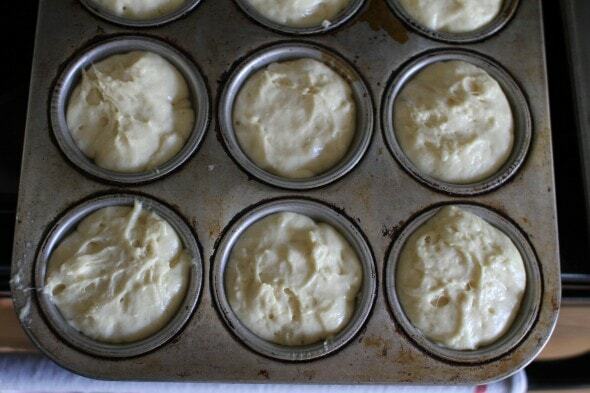 Use a metal spoon to stir dough down, then spoon dough evenly into 18 muffin cups. 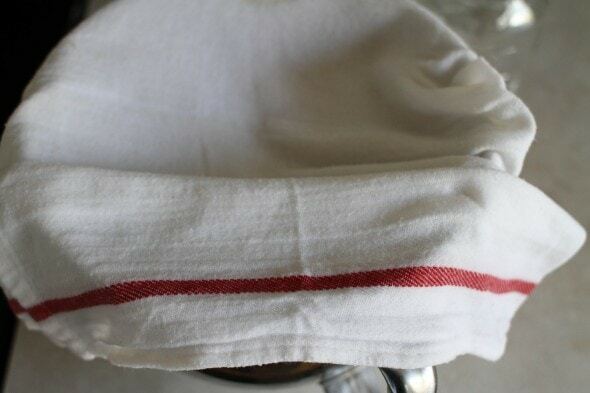 Cover pans with wet tea towel; let rise 30 minutes. « What I Spent, What We Ate | Sunday was a bit of a fail. I have recently been experimenting with a no-knead focaccia with very little yeast that ferments for about 12 hours, because I can mix it in the very early morning and forget about it until almost dinner time. I am excited to try these rolls, I think I can make this dough about 5pm and still be able to eat at 7pm with the rising times you’ve listed. My family will be excited too, as they have eaten a lot of focaccia lately . I love to serve hot bread with dinner, and I find that freash bread and butter makes an inexpensive vegetable soup and/or a meatless meal more filling for my husband. Thank you also for encouraging me to try unbleached flour several years ago. While I do make most of my bread and treats with part white whole wheat flour, I am liking using unbleached for the remainder. This looks really tasty. As a reader who has been using many of your bread recipes for several years I am quite sure that you have not posted this before. I’m excited, I love so many of your bread recipes. Well, a rubber spatula is key, I think. I never get it alllll off, but the spatula helps me get most of it. You mean we aren’t supposed to use fingers? Oops. 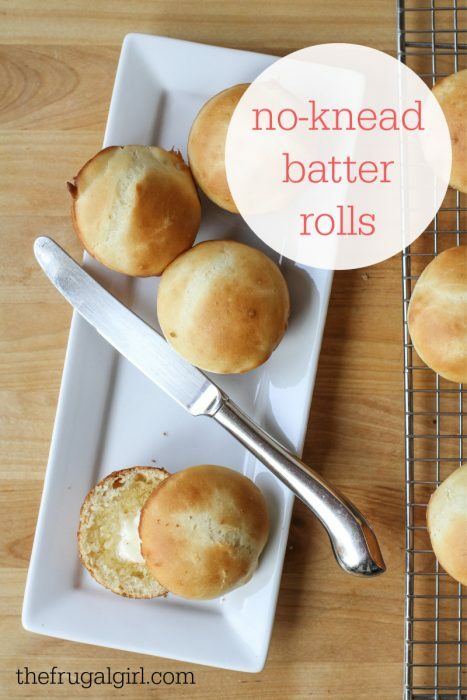 Speaking of no-knead batter, do you ever make Angel Rolls? FYI, I’m getting a video ad on your pages these days … do I remember correctly that that isn’t supposed to happen? Can you tell me where it is so that I can get it taken care of? Screenshots are SUPER helpful too. I’m seeing it only on the post page itself, not on your landing page. It’s a large box between the section. There’s an “x” to make the box go away. I see it on Mac OSX.? ?/Firefox 35 and PC/Windows 7/IE 10. I’ll try to get you a screen shot this evening. 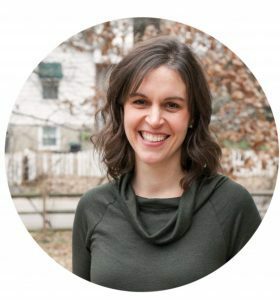 Oops, meant to comment on this up above–I’ve never made Angel Rolls but I have an Angel Biscuit recipe that causes my children to rise up and call me blessed. I experimented with White Lily flour recently and while I won’t ever use it regularly, as it doesn’t meet most of my baking needs, I made the best biscuits I’ve ever made using that flour. My recipe calls for both yeast as well as baking powder and soda, and you let it rise in the fridge. Is that similar to your recipe? That’s the one. A yeast+chemical leaven batter that can hang out in the fridge for up to a week. Lets you make one or several biscuits at a time. Ok, perfect. I think I know where that one’s coming from. Glad I went to website to print. I, too, got the surprise audio pop-up, I think at the end of the recipe before comments. Do you turn everything you bake halfway through the cooking time? I do, haven’t had an oven in 37 years that wasn’t hotter in the back. Spatula comment: Got a new one for Christmas out of the Chef’s catalog, made by KitchenAid. Doesn’t work as well on the flat beater with the flex edge, but really well with original flat blade that comes with mixer. It’s called “Better Spatula” and runs $14.95 plus shipping. “Duh” moment: keeping it in a utility drawer that’s under the mixer, rather than across the kitchen in the utensil crock. These look amazing! Thanks for sharing the recipe! I just made these and they look so yummy!! Also, I live at high altitude (~7000ft) and all I did was add a little bit more flour (maybe 3 tablespoons?) at the end. These look yummy and easy. Can’t wait to try! 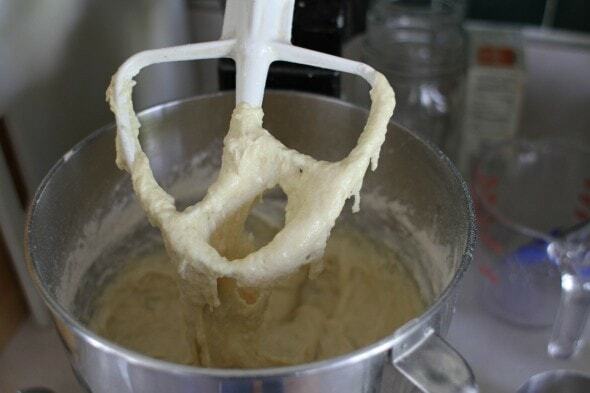 Is there a reason you specified a metal spoon for stirring the dough down? I’m looking forward to trying this one! Well, it’s a very stiff dough, so a metal spoon just works better than a plastic one, generally. Though if you have a very sturdy plastic one, that might work. 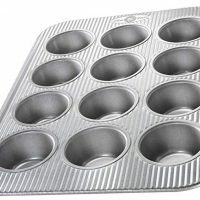 Also, a spoon with a sharper edge like a metal spoon makes scooping the batter into the muffin tins much easier. Most metal and wooden spoons have fairly blunt edges and I find they don’t work as well for these purposes. Thanks! I had a feeling it was a sturdiness factor, but wondered if there was some vital chemical reaction that a metal spoon was necessary for! No, I don’t think so! Nothing magical about the metal except the wonderful sturdiness. Made these last night and they were SO yummy and easy! I got a little nervous at the point where I had to put the batter into the muffin tins. It was kind of gloppy and I had to scoop up some batter and break it off into the cups (if that makes sense). But, I trusted the process and went with it and they were great! Do you think this same dough would work to make loaf bread or would it be too dense? Any idea how they would turn out if you omitted the egg? We have an allergy in my household. They’ll be fine-just less soft and rich. You might want to add just a little more butter to help with that. You must have posted this at some point because I have it printed out and in my recipe file from quite some time ago and have made them. Thank for re-posting as I’d forgotten about them and my family loved them! Yep, I updated it with a printable and republished it. I’m so glad you happened to need a reminder. Does the recipe work if you double it to make 3 dozen? Yep, that’ll be fine as long as your mixer bowl is big enough to accommodate a double recipe. These look so yummy. I’m going to have to try them next month (gotta wait on the grocery budget to roll around to get the yeast lol). Yes, they freeze just fine! I have recently started to make my own bread again. SO I thank you for the recipe. Do you think I could use an ice-cream scoop to fill the trays? Yes, that could work, especially if it was greased a little. I converted the measures into UK-metric weights and ml, using google and they came out great; thank you so much for this lovely recipe. Eating the rolls reminded my husband and I of (our pre-babies) US road-trip in Utah and Arizona.